An image taken by the Curiosity rover of the 18th hole it has drilled on Mars. After suffering a couple technical glitches that have put NASA's Curiosity rover off its duties on Mars this year, the robotic explorer seems to be back in full health, having driven to a new site and drilled a sampling hole, according to NASA statements. That hole is its 18th successful drilling assignment, according to NASA. It targeted a type of rock geologists with the mission have been eyeing for more than a month, but failed to successfully drill at a previous site. The drill was out of commission between late 2016 and this May as engineers addressed a problem with the instrument. But the rover had better luck at the new site, nicknamed Highfield. Curiosity is now analyzing the powder it was able to produce, which should tell scientists more about the rock at the site. The rover will also be watching how the little pile moves over time, which essentially creates weather observations by tracking wind movement, according to NASA. It's a particularly interesting time for weather observations on Mars because Curiosity's robotic companion, Opportunity, remains silent on the opposite side of the planet after a global dust storm earlier this year. Scientists hope that a seasonal weather phenomenon known as dust devils will be able to clear any lingering dust off Opportunity's solar panels and help it return to normal operations. 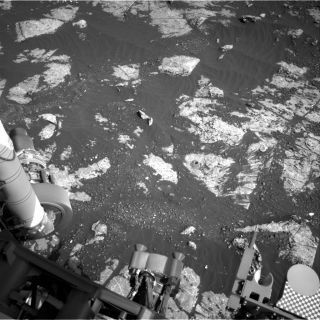 In order to reach the new science site, Curiosity had to drive about 197 feet (60 meters), according to NASA. The journey comes a month after engineers running the rover were forced to switch Curiosity to its back-up brain after a computer glitch occured on Sept. 15. Engineers are still trying to figure out what went wrong on the computer the rover had been relying on before the switch. Although the rover doesn't need both computers operating at once, they do want to repair the problem and switch back because the offline computer has more memory.